Mobil - I Say Ding Dong Shop - Buy Stickers, Decals & Unique Automobilia. Mobil 'O' Style Oblong Stickers. 5" Pair. Mobil 1 Later Square Style Sticker. 9.5"
Mobil 1 Later Square Style Stickers. 2.25", 4", 5", or 6.5" Pair. Mobil Bathurst 1968 Circuit Style Car Sticker. 4.5". Mobil Earlier Pegasus Shaped Stickers. 16" Pair. 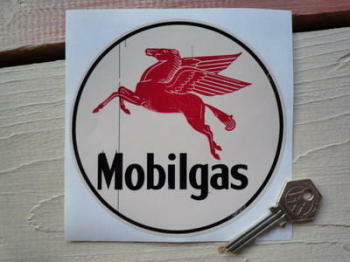 Mobil Early Pegasus Shaped Black & White Stickers. 2", 5", 8", or 10" Pair. Mobil gas Circular Worn Look Sticker. 5". Mobil Gas Station Stickers. 4" or 8" Pair. Mobil Gas Station Stickers. Set of 4. 60mm. 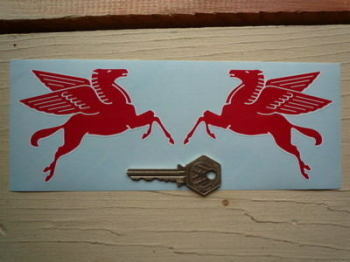 Mobil Later Pegasus Cut Vinyl Stickers. 8" Pair. Mobil Later Pegasus Shaped Black & White Stickers. 4", 6", or 8" Pair. Mobil Later Pegasus Shaped Red & White Stickers. 13" Pair. Mobil Later Pegasus Shaped Red & White Stickers. 2", 4", 6" or 8" Pair. Mobil Mobilgas Black & White Oblong Sticker. 11". Mobil Mobilgas Black & White Oblong Sticker. 19". Mobil Mobilgas Circular Sticker. 12". Mobil Mobilgas Circular Sticker. 6.5". 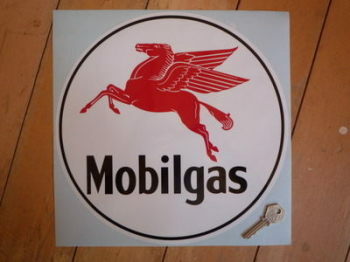 Mobil Mobilgas Mobiloil Pegasus Circular Shaped Stickers. 3.5" or 5.5" Pair. Mobil Mobilgas Shield Sticker. 10" or 12". Mobil Mobilgas Shield Sticker. 6". Mobil Mobilgas Shield Stickers. 4" Pair. MOBIL Mobilgas Special Circular Sticker. 12". 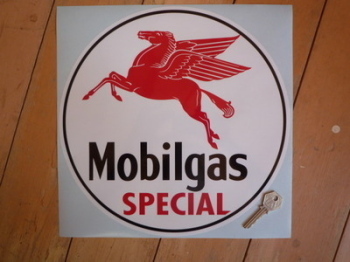 Mobil Mobilgas Special Circular Sticker. 6.5. Mobil Mobiloil Black & White Cut Vinyl Sticker. 17.5". Mobil Mobiloil Black & White Oblong Sticker. 11". 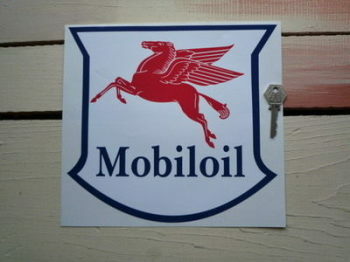 Mobil Mobiloil Gargoyle Authorized Service Oblong Sticker. 10". 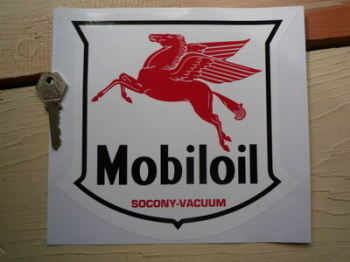 Mobil Mobiloil Gargoyle Vacuum Oil Company Oval Sticker. 8". Mobil Mobiloil Navy, Red & White Non-Serif Style Shield Sticker. 10". Mobil Mobiloil Navy, Red & White Oval Sticker. 19". Mobil Mobiloil Navy, Red & White Serif Style Shield Sticker. 10". 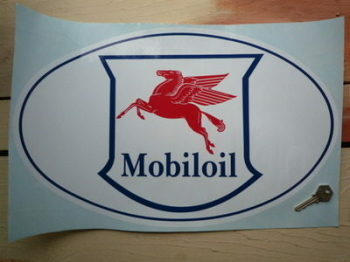 Mobil Mobiloil Pegasus Circular Sticker. 11" or 12". Mobil Mobiloil Socony Vacuum Shield Style Sticker. 8" or 10". Mobil Mobiloil Socony-Vacuum Shield Stickers. 3" or 4" Pair. Mobil Mobiloil Vacuum Gargoyle Oil Dispenser Sticker. 12". 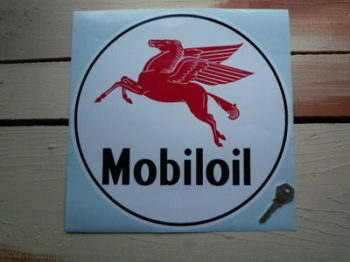 Mobil Mobiloil Vacuum Gargoyle Oil Dispenser Sticker. 21.5".